Many larger companies have a VP of Corporate Development. The role of this position often includes strategic planning and answering the question – what should we be doing to grow faster than our sales force and engineers can deliver? This often includes identification of new market opportunities, development of acquisition based growth strategies and plans, and implementation of those strategies. It can also include development and management of partnerships and joint ventures as well as divestitures of no longer favored business segments. Bottom line, corporate development and M&A activities are inseparable. 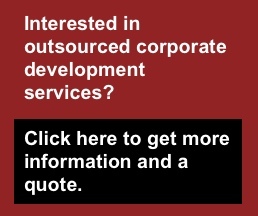 Many mid-market companies struggle with corporate development. Maintaining a dedicated corporate development staff is expensive and can only be justified for a company doing multiple deals per year. As a result, any M&A activities are usually left to senior management. A company’s owner or CEO is generally the point person for corporate development efforts. However, he or she is often caught up in the day to day operational issues of the company and has limited time to spend on M&A. Further, while owners may do a great job developing an acquisition strategy, they often are not great at the detail work and follow through required. As a result, M&A efforts tend to get delegated, usually to a senior financial manager (CFO) or sometimes to an operations manager. These individuals are even more time pressured and less experienced. As an example, let’s assume that the president of Company A wants to forward integrate his operation. He conveys this message to his senior management group. This group may know a limited pool of potential acquisition candidates through customer contacts. However, they are concerned about the potential to damage these relationships when divulging the acquisition strategy. Or if they did approach and received a favorable response, they are not familiar with the financial analysis techniques and valuation methods that are employed to develop a range of value for the target. Finally, in all likelihood these individuals have very limited experience in offer presentation and negotiation. This illustration makes it clear that using an intermediary can have distinct advantages. First, inquiries are not made on a face to face basis and thus are far less likely to damage existing relationships. Second, a qualified intermediary will have research capabilities that will identify a much larger pool of candidates. Third, a qualified intermediary can analyze a target’s financial data, make a determination of value, present an offer and negotiate a final price on behalf of their client. Finally, an intermediary can assist with coordinating the due diligence process as well as the closing process. Many buy side intermediary relationships are based on contingent success fees, meaning that they earn no fees until a transaction is closed. This gives the intermediary little incentive to invest upfront time seeking transactions for client. Sell side investment banking firms that do offer buy side advisory services often require levels of upfront retainers associated with sell side engagements. Tower Corporate Advisors specializes in acquisition advisory and search services and with the investment in staff and capabilities is able to offer these services with lower upfront costs. Our service levels are all premised on the idea that we want to develop a partnership with our clients. We will invest time to learn their businesses and help develop acquisition strategies. We offer several service tiers, each increasing in scope and upfront costs. In all cases, the upfront costs are low and predicated on the understanding that Tower will receive closing fees for any deal that is closed as a result of these services. Ultimately, our objective is to make the acquisition so successful for our clients that they are motivated to continue to pursue a growth through acquisition strategy and that we can continue as a trusted advisor.